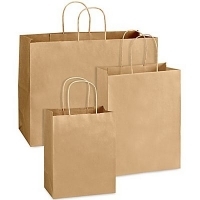 Send a buying inquiry to Paper Bags, from Staremerald Exports, India. Product Id 872773. The Paper bag is the new trend these days. We can see men and women carrying paper bags from almost everywhere. They bring it from malls, offices and grocery stores. This trend might have been developed because of the clothing sector. Famous clothes store design their paper bags with their own company or brand logo to attract their customers. The people holding these particular bags get recognition because it gives those who see them an idea that they own a classy product.